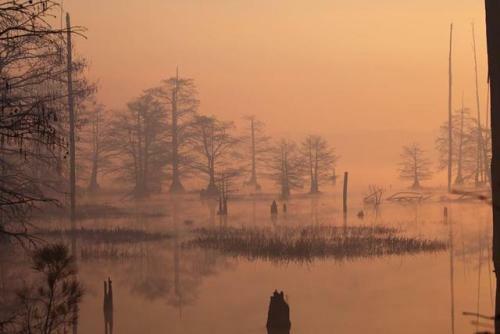 On foggy mornings, an eerie calm falls over Sam D. Hamilton… – Sig Nordal, Jr.
March 27, 2018 March 27, 2018 Sig Nordal, Jr.
On foggy mornings, an eerie calm falls over Sam D. Hamilton Noxubee National Wildlife Refuge in Mississippi. The water is still and the air is thick. With 48,000 acres of forests, fields and waters, the refuge is excellent habitat for eagles, alligators and the endangered red-cockaded woodpecker. Visitors enjoy fishing, hunting, hiking, and wildlife photography and observation. The refuge also serves as an outdoor classroom for Mississippi State University and other local educational institutions. Photo by U.S. Fish and Wildlife Service. Next Article A New Dawn in Uzbekistan?